The career of Lester Piggott, who won the Triple Crown on Nijinsky, will be celebrated at Haydock today. THE 70th anniversary of legendary jockey Lester Piggott’s first winner will be celebrated at Haydock today. A special race is being staged in honour of Piggott who rode his first winner, The Chase, at the Merseyside track in 1948 when aged 12. Lester Piggott: Won his first race 70 years ago at the tender age of 12. Now 82, Piggott will be present at Haydock today for the Smarkets Lester Piggott 70th Anniversary Handicap in which trainer Eve Johnson Houghton hopes Frank Bridge can prevail and rekindle memories of her family’s association with the 11-times champion jockey jockey. “It would be lovely to win given the family history,” said Johnson Houghton. “I’m sure we’ve won a race named after Lester before. “Dad won it – I’m sure it was a sprint. Piggott’s final success also came at Haydock courtesy of the Jack Berry-trained Palacegate Jack in 1994. In total, Piggott – known as ‘The Long Fellow’ because of his unnatural height – rode 4,493 winners and his record 30 domestic Classics includes nine Epsom Derbies. He won the Triple Crown in 1970 with Nijinsky, the last colt to complete the feat. Top prospect Dark Vision will stay in training with Mark Johnston after being purchased by Sheikh Mohammed’s Godolphin operation. Bought for just 15,000 guineas at Tattersalls, he has won all three starts in impressive fashion for the Kingsley Park 10 syndicate. Dark Vision took his form to a new level last week when he came from last to first to win the Vintage Stakes at Goodwood in eyecatching fashion. Connections of Royal Ascot heroine Main Edition are confident she will take the step up in trip in her stride in the Sweet Solera Stakes at Newmarket today. 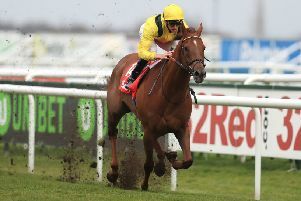 The Mark Johnston-trained daughter of Zoffany will bid to leave her effort in last month’s Duchess of Cambridge Stakes at the Suffolktrack behind by attempting to concede 3lb to her rivals on her first try over seven furlongs. Roaring Lion will step up his preparations for York’s Juddmonte International later this month with a racecourse gallop at Newmarket today. Trained by John Gosden, the grey won York’s Dante Stakes in May before finishing third to Masar in the Epsom Derby after just failing to see out the mile-and-a-half trip. However, Oisin Murphy’s mount proved himself to be a 10-furlong champion when landing Sandown’s Group One Coral-Eclipse last month in a thrilling battle with Aidan O’Brien’s Saxon Warrior who is also on track for the Juddmonte. Rivals also include Sir Michael Stoute’s Poet’s Word who has enjoyed two high-profile wins at Ascot this summer.